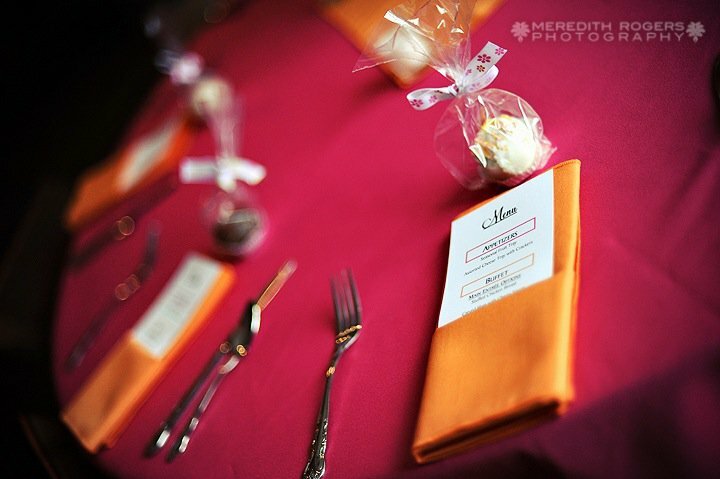 For our favors, we decided to do cake balls. They were delicious! We bought 2 devils food and 2 classic white cake mixes, along with 2 milk chocolate, and 2 white cans of frosting. We basically followed the directions found on Bakerella. We made enough to alternate flavors at each place setting at the reception, and this is how they looked on the tables..
Bake all of the cake mixes according the box directions. 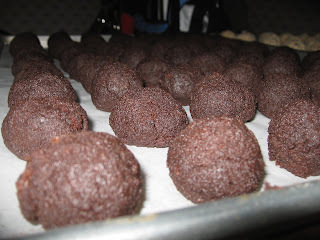 Allow all of the cake mixes to cool appropriately before the cake ball process. Once the cakes have cooled, crumble one pan of cake into a large bowl. (This is one of the fun parts since I doubt you were allowed to do this as a kid =p). Crumble the cake evenly so that the frosting will coat better. Add 1 can of frosting to the now-crumbled cake. Make sure to have squeaky clean hands or gloves before this next part. Begin mixing the frosting with the crumbled cake. It will be easier to complete this step if you use your hands, and not just a spoon, but using a spoon will do the trick too. Mix until all clumps of frosting have been mixed, and the cake resembles dough. 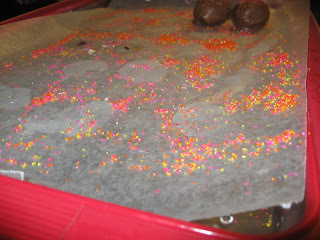 Find a flat surface, and cover your cookie sheets with parchment paper. 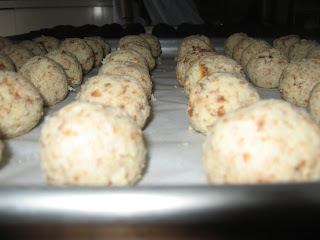 Begin rolling small amounts of the cake between your hands to make a ball. The cake balls that we made were roughly 1"-1 1/2". 7. 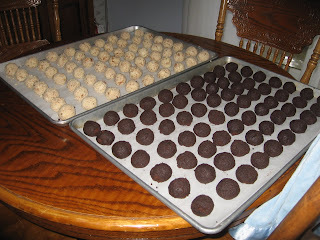 Once all the balls have been made, place the cake balls into the freezer for about 2 hours for them to set. WARNING: DO NOT ADD ANY LIQUIDS TO THE CANDY MELTS BECAUSE YOUR CANDY WILL NOT MELT PROPERLY OR COAT THE CAKE BALLS EVENLY WITHOUT HARDENING TOO FAST! THIS INCLUDES FOOD COLORING. 9. When coating the cake balls in candy coating, it is best to use a spoon to coat them evenly, as well as to work with a partner. 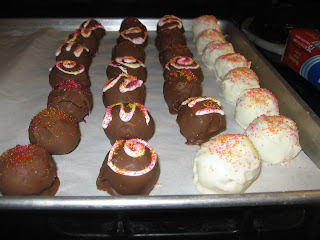 In our situation, we had one person coating each ball, while the other decorated them. They need to be decorated immediately after coating because they will dry pretty fast. Make sure to allow the cake balls to cool in the refrigerator for at least 30 minutes to set again before you begin wrapping them in cellophane. They could potentially sweat. I love cake balls. They take a while to make, but they're so delicious! They looked so good! I'm sure they were a hit!